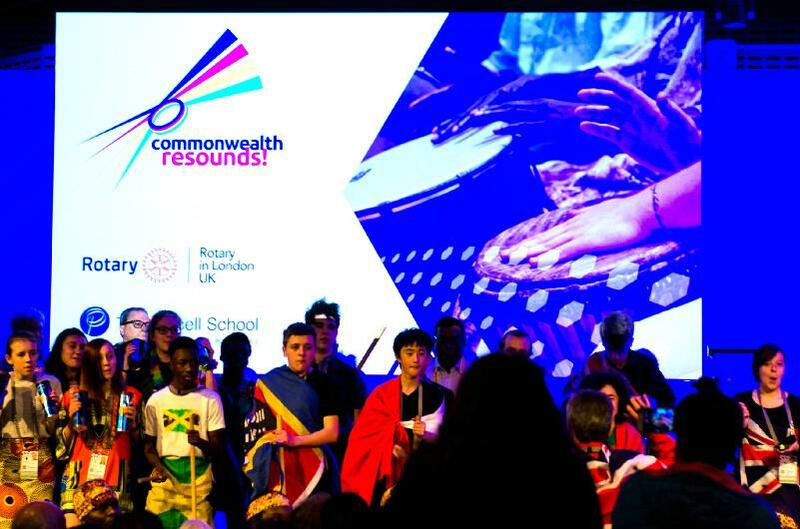 The Rotary Club of Westminster West icollaborated with The Commonwealth Resounds and The Purcell School of Music to arrange a programme of Drumming Performances during the week that Commonwealth Heads of Government Met in London. Wednesday 14th March 2018 – Tree Planting at St Georges Park, Newham. An order for 210 trees was placed with the Woodlands trust and these were handed over to Newham Council. The trees have been planted at the King George V Park in Newham and the Council has agreed to maintain these trees. Members from the Rotary Clubs of Tower Hamlets, Newham, Stratford and Westminster West have come together to support this project. The tree planting is part of the Commonwealth celebrations that begin on Commonwealth Day on 12th March and end of 20th April 2018 – which marks the end of the events pertaining to the Commonwealth Heads of Government Meeting (CHOGM) in London. 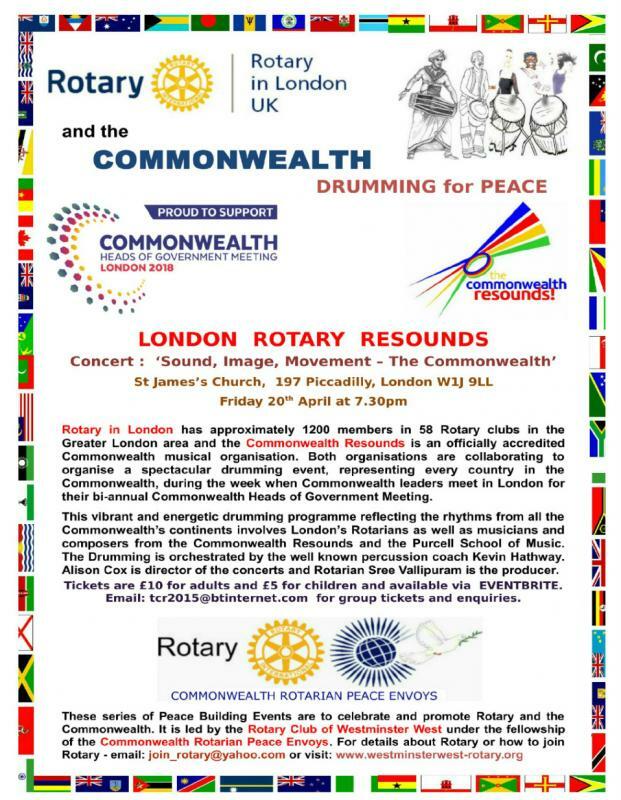 Tuesday 17th April 2018 - Rotary in London and the Commonwealth, Drumming for Peace. 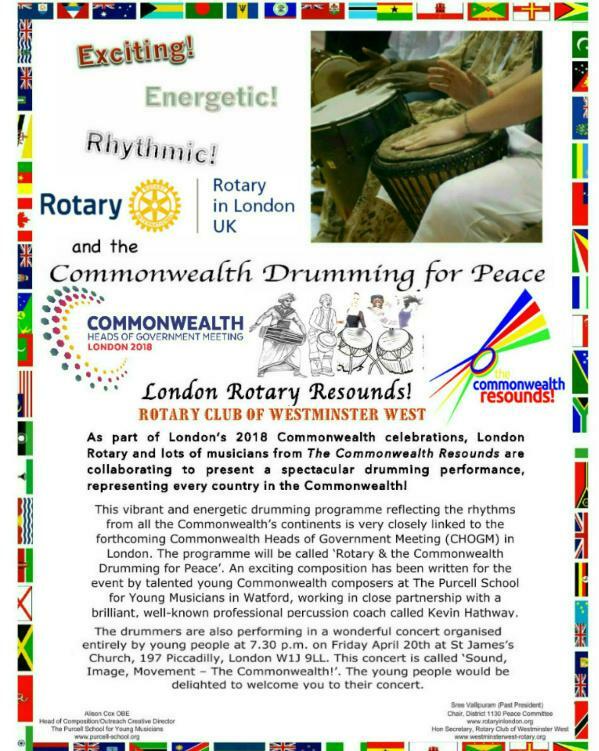 This performance will be at the Queen Elizabeth II Centre in Westminster and is called Rotary in London and the Commonwealth Drumming for Peace. A number of Commonwealth Forums are being held at this venue and HM the Queen and Commonwealth Heads of State are expected to attend at various times during the day. 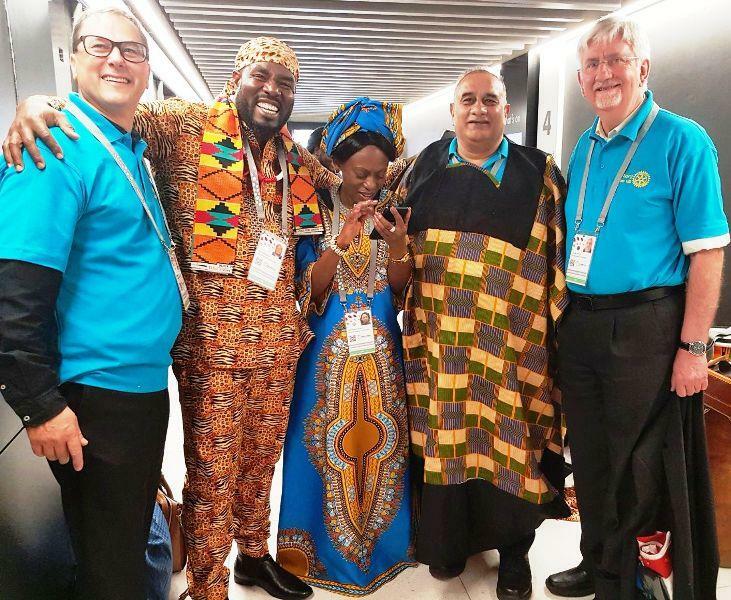 London Rotarians and drummers representing the 53 Commonwealth countries are performing under the direction of Kevin Hathway who is a renowned professional percussionist and musical director. The music has been composed by young Commonwealth students from the Purcell School of Music under the direction of Alison Cox, Founder of The Commonwealth Resounds. Precise details of the timings will be known in due course as arrangements for this event are being handled by the CHOGM organising committee based in the UK cabinet office. This event is being fully supported by the Rotary Club of Westminster West. 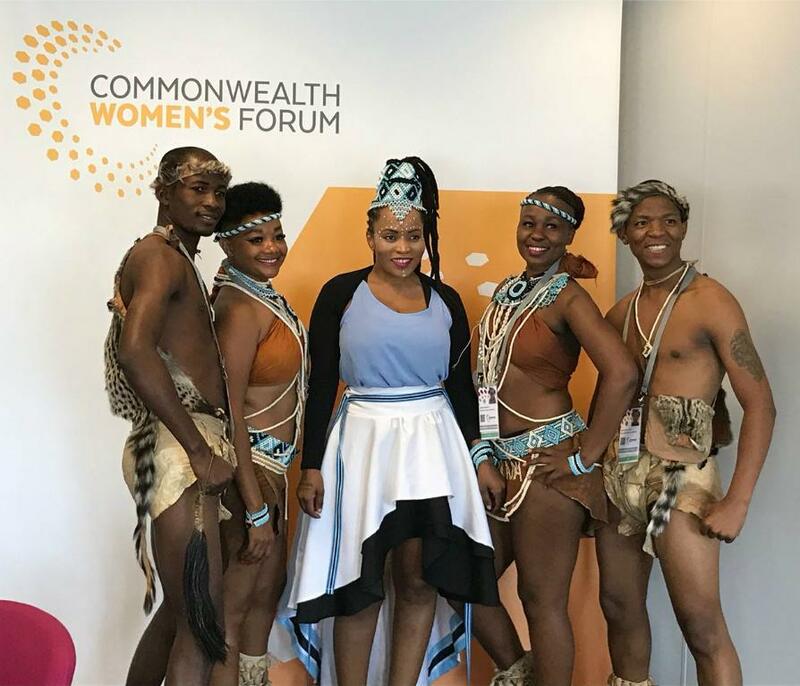 Tuesday 17th April 2018 – The Commonwealth Big Lunch. 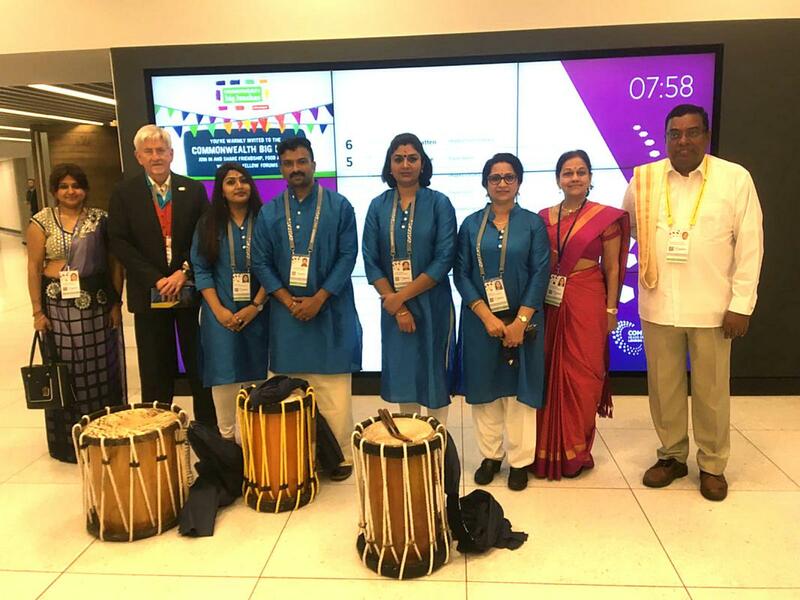 Rotary in London and the Commonwealth Resounds are bringing their performers and support teams together to celebrate their connections by hosting a Commonwealth Big Lunch during their lunch break at the QE II Centre. Lunch would probably take place in St James’ Park or Parliament Square. There will be approximately 70 performers and logistics supporters present for this event. All present would be requested to bring a packed lunch. Packet drinks and water will be provided to supplement the lunch. Negotiations are being held with a drinks supplier for provision of the drinks. 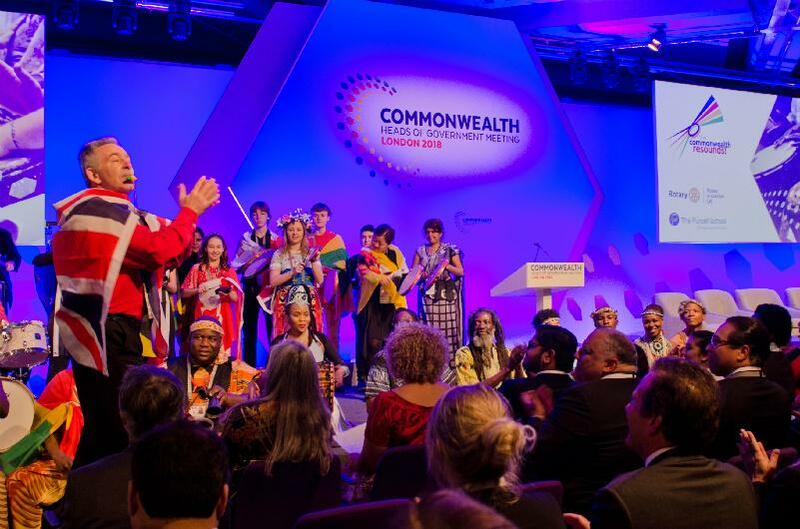 The Commonwealth Big Lunch is being advocated by the Eden Communities Project with the aim of bringing people together to celebrate their connections between Commonwealth Day on 12 March and 20 April when the Commonwealth celebrations end. We will be joining people across six continents to celebrate community and build new connections. The Big Lunch which is the official Eden Communities Project takes place every year and falls on 7th June this year. 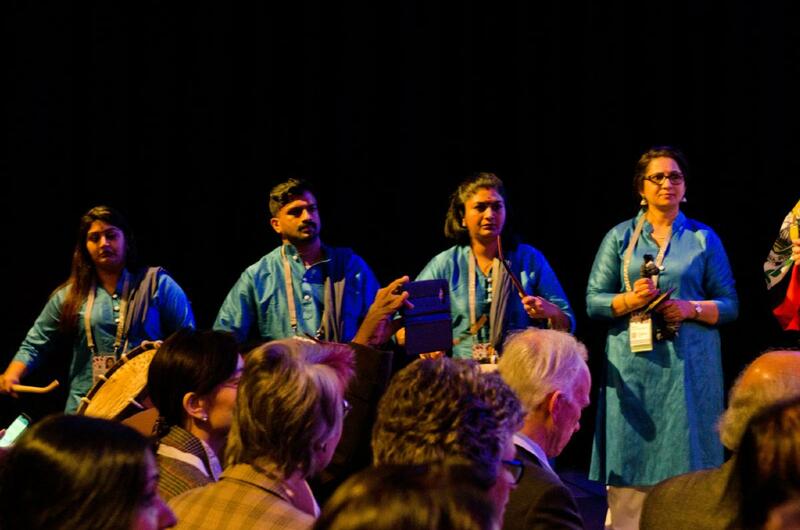 Thursday 19th April 2018 – Peace Songs dedicated to Rotary in London and the Commonwealth. The peace songs were composed by children and young composers, using poetry written specially for this event by Commonwealth poets. The young people will perform at St George's, Hanover Square(2a Mill Street, W1S 1FX) and are part of the Commonwealth Festival Choir and Orchestra. 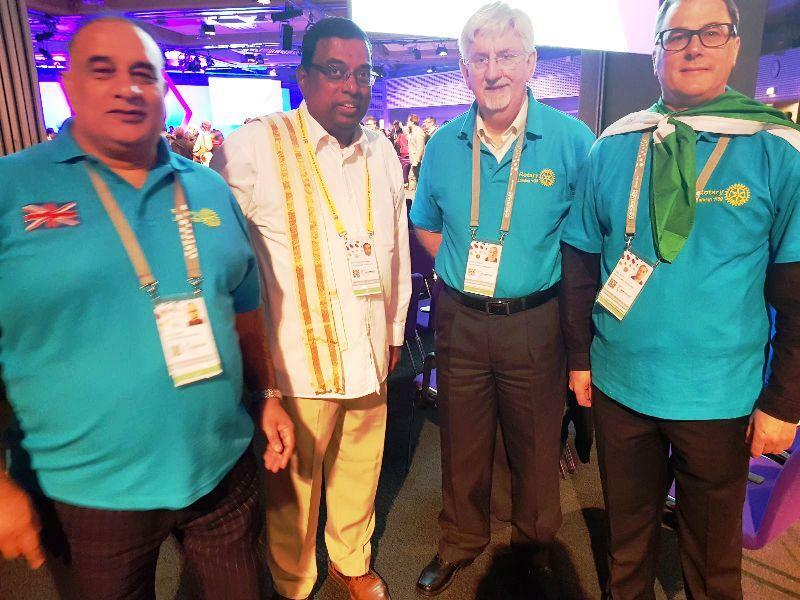 Guests of Honour include Sree Vallipuram, Mike Hodge who is the London Rotary District Governor and Dr Josephine Ojiambo who is the President of the Rotary Club of Westminster West. Proceeds from this event will go towards supporting victims of Hurricane Irma in Antigua, Barbuda and Dominica. This event is being organised by the Commonwealth Resounds and is partly supported by the Rotary Club of Westminster West and mainly supported by the Royal Society of St George. Friday 20th April 2018 – Sound, Image, Movement – the Commonwealth. Rotary in London and the Commonwealth Drumming for Peace will perform at St James's, Piccadilly (197 Piccadilly, W1J 9LL) as part of a very special, colourful concert for young people featuring light classical music, folk, jazz and world music created and directed entirely by brilliant school-age musicians from The Purcell School. Guest of Honour will be Her Excellency Karen-Mae Hill, High Commissioner of Antigua and Barbuda. Proceeds from this event will go towards supporting victims of Hurricane Irma in Antigua, Barbuda and Dominica. The Concert is organised by The Commonwealth Resounds and is sponsored by the Rotary Club of Westminster West.